Channeled through Wes Annac, The Culture of Awareness, Oversoul TeachingsThe work you do for humanity’s evolution is more important than we can express, and you’re encouraged to embrace your work when you could otherwise embrace material things that don’t fill you with nearly as much satisfaction. 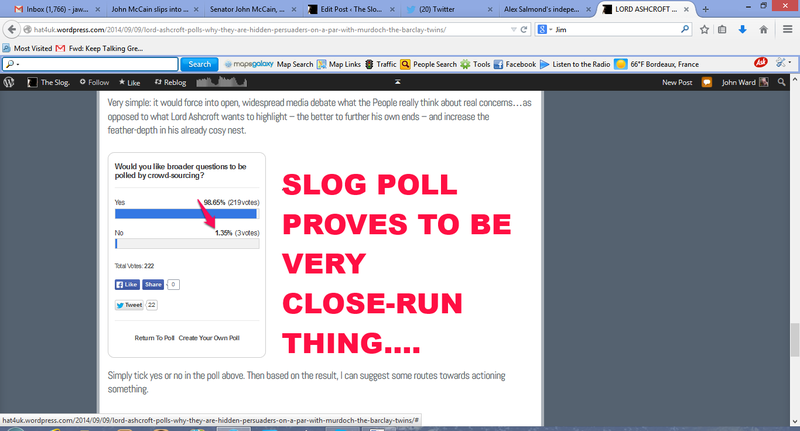 222 people took part in the survey, voting for which closed last night. As you can see, by a mere hair’s breadth, some 98.65% of the People would like broader topics to be surveyed in opinion polls, and approve of the idea of crowd-sourcing to get it. I will contact some research companies and see what can be done. And yes, now you can comment…. 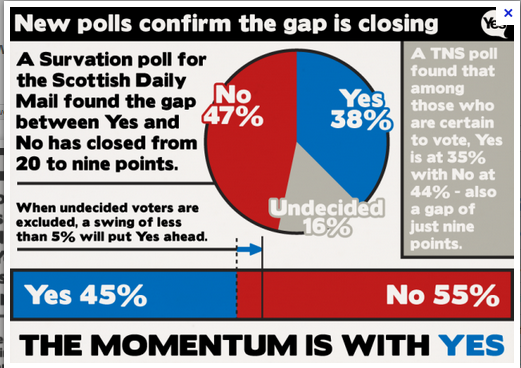 Earlier at The Slog: British media ignore Yes gains, falsify No gains in the Indyref. Quelle surprise. Barack Obama says he is joining the EU initiative to impose a new round of sanctions on Russia. Both Washington and Brussels say the sanctions will target finance, energy and defense sectors – yet can be revoked if the situation in Ukraine improves. The US is to provide details of their sanctions on Friday. “These measures will increase Russia’s political isolation as well as the economic costs to Russia, especially in areas of importance to President [Vladimir] Putin and those close to him,” US President Barack Obama said in a statement on Thursday. The US says that Russia has sent heavily armed forces to Ukraine. Obama added that the US may withdraw sanctions if Russia fulfills obligations under the Minsk agreement.